Total Annihilation (TA) – which I remind you was released in 1997 – allowed immense maps, at least if you had the 256MB of RAM needed to run the largest. 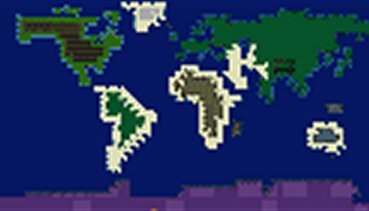 “Real Earth”, this map (by Emperor Dracula) is 63*63 screens across. Some maps in Supreme Commander (SupCom) are even larger, at 81*81. While not all maps are that large, and certainly the largest maps are rarely played because they can lead to hours-long games, certainly there are a lot of games played on maps which are far larger than those used in RTT games, which very rarely indeed exceed 10*10 screens, sometimes a little larger with a lot of dead-space. That’s not the only measure of scale, though. Starcraft limits each player, for instance, to 200 “supply” units. This is a mechanical rather than technical limit, designed to make you pick and choose between types of unit (larger units consuming more supply), and works to make players come into conflict faster. On the other hand, TA and SupCom have unit limits such that one unit is one “slot” of a much higher limit, there purely for technical reasons. Editing a .ini file lets each player have up to 500 units each, and 3rd party patches can increase this to 5000. The sort of scope of both map size and unit count are important for our RTS. Combining these with the sort of zoom icon-based map SupCom introduced and which Planetary Annihilation has usefully iterated on (for all the problem of not being able to follow the action on both sides of a sphere) leads to true strategic gameplay! If you look at Starcraft or the Dawn of War series, for instance, many units have one or more special abilities, which must be triggered and often combined to create devastating effects. While this works – brilliantly – in tactical games, in a strategy game this sort of micro-management is something to be strongly avoided. Only the largest units – vast cannon and the largest units which take a long time to build might need any significant degree of micro-management. While it might seem “bland” to have units without special abilities – Grey Goo has recently been criticised for this – but it can be countered in several ways. If units have strong roles, rather than overlapping too much, they feel considerably less bland. This is actually an issue with TA – less so with SupCom, but still to some degree there – that many units end up not being used because other units simply take the roles too well. Thus, it is better to have a smaller number of more specialised units. In this case, there is a case for detail – the detail of slotting together different unit types for combined-arms, making sending in mixed groups of units better than single unit “blobs”. One can also actually give units special abilities…but not require the player to trigger them. For example, if a unit has a AoE attack, which does relatively low damage compared to it’s primary gun, then it should fire only when there are enough enemies to make this worthwhile. Or a walker unit with both anti-tank and anti-personnel guns, and which can only fire one set at a time could intelligently switch between them depending on it’s target. This makes units feel and look interesting, without requiring constant micro-management. Without the need to micro-manage units, this “lack of detail” allows far larger scale and scope in battles without the player feeling like he is missing out on anything. What? Yes, automation. Having to deal with every little fiddly detail goes right back to “micro-management”. There’s several areas of this as well. For example, giving “area orders”. Not only an area attack order, as is in many RTS games, but allowing patrols by selecting a map area rather than individual waypoints….allowing the debris of a battle to be cleaned up with an area reclaim order to some construction units and so on. The sort of “build queue” and the ability to see it from TA/Supreme Commander is partway there, but you can generalise this to a building system with priorities rather than setting long build queues for individual construction units. Then we come to templates – let people have pre-built “templates”. Let’s not have people need to place exactly the same old build order every time, but drag and drop their initial build order or strongpoint they want built, then go onto more interesting things. I’ve been asked “dosn’t this make the game formularic”? Well, compared with what? Starcraft’s builds, where initially seconds in a series of clicks matter? Look, there’s this thing which will get in the way – it’s called “the enemy”. The trick is to make raiding cheap and early defences against it imperfect – if you don’t pay attention then things should be able to go wrong…rapidly. I note many strategy games already allow you to order units or a series of units from factories (or even an endless string of them), this is just an extension of that! Player-written AI can, of course, also use many of these as building blocks for challenging players – just one of the additional, oh-so-useful side effects of “automation”. The key is, though, to stop the player needing to be constantly focused on any one piece of the tactical picture, and to allow him to see the strategic one. I touched on this in point two. Quite simply, if you can make a “battle blob” of one type of unit and drive it to victory, then players will. It’s even less interesting that the rock>paper>scissors model which dominates in some kinds of RTT games, to the extent in some that the battle is decided even before it behind between certain types of unit. It’s far better when balance is emergent – that players want to use different types of units without feeling forced into a given strategy. If the “tank blob” is a strong strategy, then it should have weaknesses. It will take time to cross ditches (which can be levelled by rockets), it can be vulnerable to infantry ambushes (which can be countered by either sticking to open terrain or by your own supporting infantry), to long-range artillery fire (don’t send all your units through a chokepoint, or use your own long-range weapons…)…the point is that by having a wide range of units, with their own roles, you end up using a variety of them or losing to players who don’t try single-unit strategies. This can be helped along by any number of systems such as having strong (but short ranged) defences to armour/damage systems. By having the player have to think about a range of units, they are thinking about the strategic picture. Communities can do wonderful things with data-driven games. TA is a game where significant discoveries and addons are something which are ongoing within a small but dedicated community – for a 1997 game – and third party “demo recorders” are still adding (as well as the ability to record games) significant new features – and the community has packaged up into unofficial patches! None of this would have happened, and does not tend to happen, with games which make themselves hard to mod. Total Annihilation is very much the holy grail for this point – it’s an amazingly flexible engine which (even before TA Demo and the DLL hooks) lent itself to things like space combat Total Conversions – like my TA Dark Suns. It’s not just about the community, though – data driven engines lend themselves to designers being able to iterate rapidly, to polish the balance to a degree simply not seen with games where they must navigate more arcane tools than simple XML editing and XML editing tools, with specific views for things like unit animation as needed. If the tools are not right, you won’t get a polished, strategic, game. What’s your overall strategy? There should be multiple end-game strategies, unlike for example the Red Alert games with their superstructures. Planetary Annihilation has quite a few of these, and they’re great – huge attacks of conventional forces, planet smashing, nuclear missiles, portals into the enemy base…there’s quite a few which can be explored. While being able to “bust” a defence is good, you also need attributional strategies – stalemate is the bane of the strategic game. SupCom in particular was prone to this because of it’s shields – which allowed you to absorb enemy fire if you stacked enough of them….without taking damage…negating a lot of strategies.